When I visited the Musée Carnavalet in Paris, I stumbled upon a painting that reminded me of Odette Swann. This time, when I visited the exhibition Les Impressionistes et la mode, I saw the painting Le Cercle de la rue Royale by Tissot. When I looked at the caption, it listed the men painted there and I saw that Charles Haas was the last one on the right. I thought: He’s the one Proust based Charles Swann upon and I noted down the reference of the painting. Like Haas, Swann was a member of the Cercle de la Rue Royale and of the Jockey Club. Et pourtant, cher Charles Swann, que j’ai connu quand j’étais encore si jeune et vous près du tombeau, c’est parce que celui que vous deviez considérer comme un petit imbécile a fait de vous le héros d’un de ses romans, qu’on recommence à parler de vous et que peut-être vous vivrez ». Si dans le tableau de Tissot représentant le balcon du Cercle de la rue Royale, où vous êtes entre Galliffet, Edmond de Polignac et Saint-Maurice, on parle tant de vous, c’est parce qu’on voit qu’il y a quelques traits de vous dans le personnage de Swann. And yet, my dear Charles——, whom I used to know when I was still so young and you were nearing your grave, it is because he whom you must have regarded as a little fool has made you the hero of one of his volumes that people are beginning to speak of you again and that your name will perhaps live. If in Tissot’s picture representing the balcony of the Rue Royale club, where you figure with Galliffet, Edmond Polignac and Saint-Maurice, people are always drawing attention to yourself, it is because they know that there are some traces of you in the character of Swann. He was quite smug, wasn’t he? Or confident in his gift as a writer, which is not the image the Narrator gives about his writing abilites. 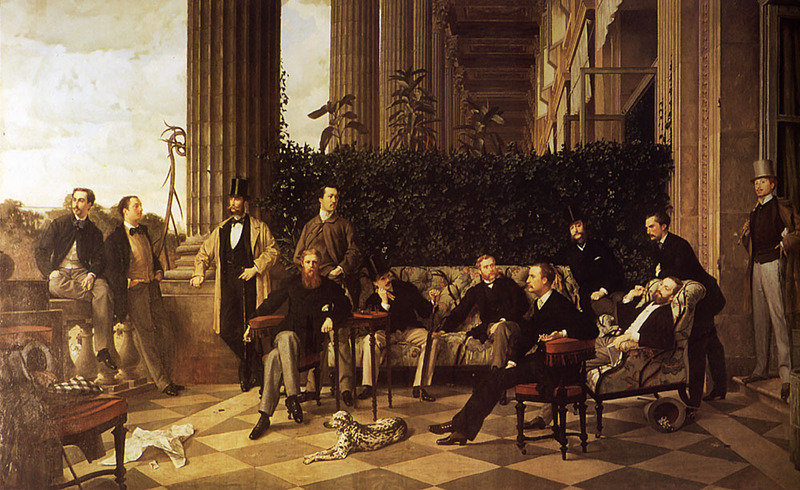 The reference to the painting by Tissot leaves no doubt: Charles Haas and Charles Swann are one unique person. More importantly, in this passage, the Narrator is dropping the masks and writes as Marcel Proust and In Search of Lost Time sound like his memoirs. So, look at the picture, the man on the right with a hat is Charles Haas/Swann. A little research on Wikipedia teaches you that Edmond de Polignac is supposedly the one who introduced Charles Haas to Marcel Proust. Gaston de Galliffet inspired the Général de Froberville, involved in the Dreyfus Affair. 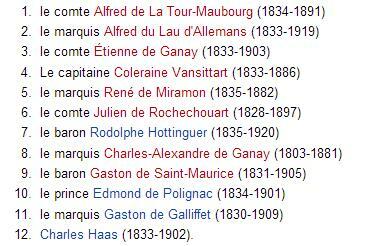 These men were used to spending time at the Comtesse Greffuhle, who inspired the Duchesse de Guermantes. Wow, thanks. I never really understood that passage. I imagined this would interest you. I was surprised to read this passage in La Prisonnière. Exciting to find this on your Paris trip! Hello, thanks for visiting and commenting. Yes, it was exciting. It’s always great when your reading life meets with your real life. In this exhibition, they also put chairs along the wall with names of the famous people of the high society of the time. One had Marcel Proust’s tag. You’re right, he says peut-être. It’s very rare that he sounds smug like this. This passage sounds like he slipped and forgot to write as Marcel, the Narrator. You’re welcome; I thought other lit lovers could enjoy this too. Is he the one standing in the doorway wearing the top hat? I have one of the Penguin-published Prousts with that painting on the front, and I’ve always loved the lounger. He looks like a man who, if you peeled him a grape, would discover that he was too languid to actually eat it. Swann isn’t the guy on the lounger, he’s the one on the right with a hat. I think the one on the lounger is Edmond de Polignac. Yes.The actor Eric Ruf plays Swann in the TV version of In Search of Lost Time directed by Nina Companeez. After seeing that painting, I think it was a good choice. My book Paintings in Proust by Karpeles confirms that Proust actually mentions this painting in his book, so its fascinating to read your article here which provids more information. No, definitely the Duchess. Look it up on Internet.